The Metrobus service in St. John’s is setting up a series of “smart” kiosks that will allow bus users to get Wi-Fi and charge their phones while waiting for their ride. 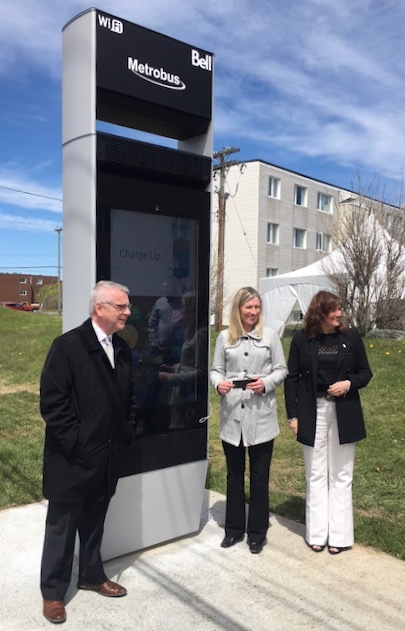 The first of five planned kiosks was unveiled Thursday near a bus shelter next to the Homeport Hotel on Torbay Road. Another kiosk is planned for across the street, with three others coming over the summer at locations downtown and on Kelsey Drive. The aluminum, weatherproof kiosks have touch screens where passengers can also get real-time bus updates and call emergency services. Wi-Fi is available in a 70-metre zone around the hub. “We will actually have real time cameras on the units as well, which is a safety feature for our customers as well as the neighbourhood,” said Metrobus general manager Judy Powell. It’s part of a “smart city” partnership with Bell, through a lease agreement. St. John’s is the first to try it out.